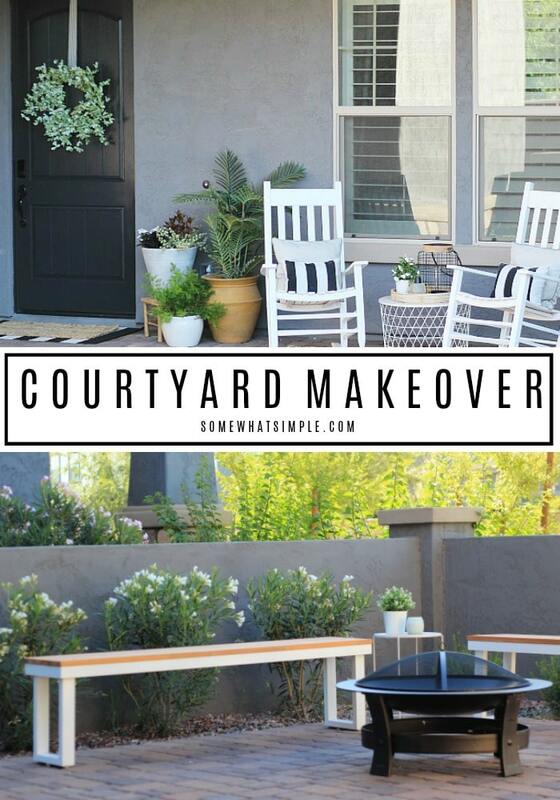 Our front courtyard makeover is in partnership with Kwikset and Lowes. All opinions are 100% my own. The time has come for the reveal of our front courtyard, and I’m so excited to show you what we’ve done with this space! 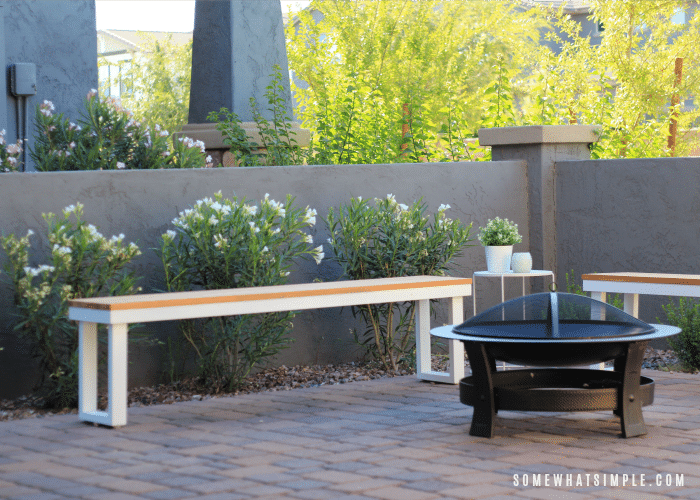 A courtyard can be used for outdoor entertaining or as a way to welcome guests to your home. They are one of those spaces that can be kind of hard to decorate… because sometimes, what looks good is not always functional, and what is functional does not always look good. Overhead shot of our front yard. Notice the small walkway and unused space filled with rocks and small plants. When we first started construction on our home, the standard courtyard that our builder offered was not my favorite. It was not very pretty, and it was completely un-useable. The courtyard had a little paved walkway up to our front door that was surrounded by a garden of rocks and a few plants that were kind of more like sprawling twigs. (Welcome to Arizona!) I not only hated weeding this space, but it just looked hot and dry and there wasn’t really a reason to sit out there. I really wanted to pave over the rocks, add some greenery, and have a beautiful paved courtyard that would allow us to host small gatherings for neighbors and friends. So that’s exactly what we created. 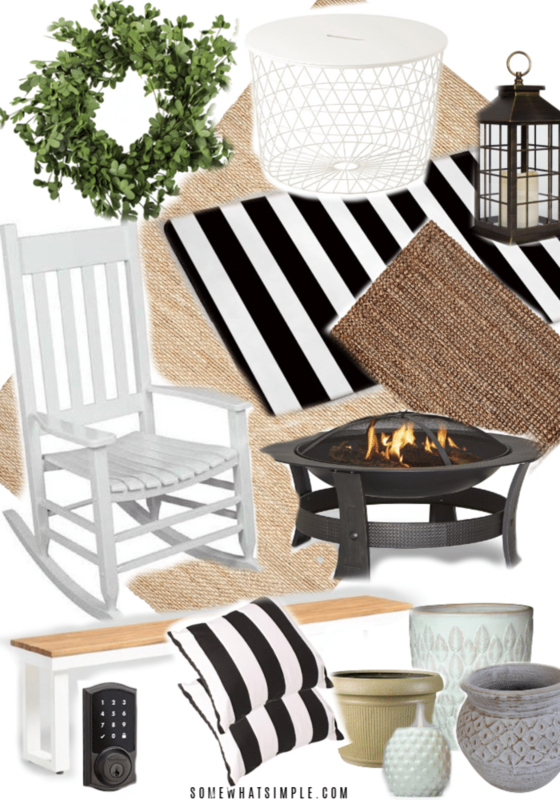 Seating: A relaxed sitting area with mission-style rocking chairs and an outdoor rug. Pavers: Pave the majority of the space so the courtyard becomes more useable. Leave a small border for plants. Plants: Line the walls with low-maintenace bushes and shrubs to add some color and dimension. Add some vines along the tall side wall. 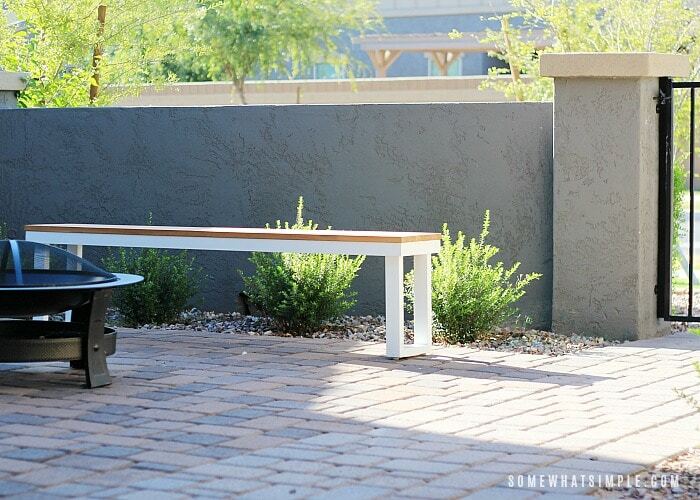 Entertaining: Ample seating and a fire pit for gatherings with friends. 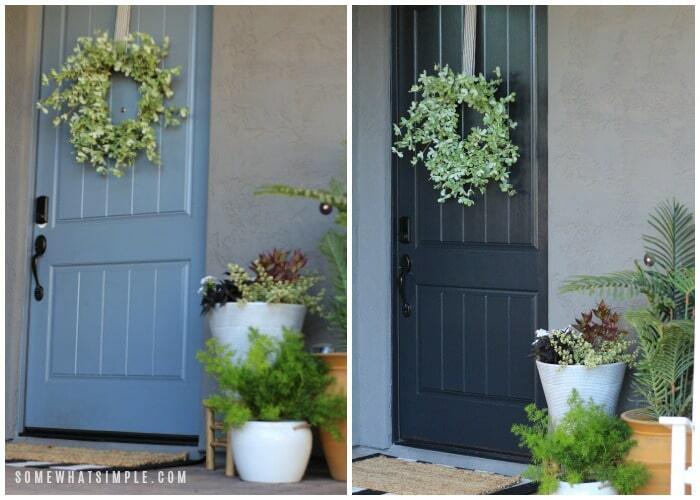 Updates: Paint the blue door black to add some contrast against the stucco. 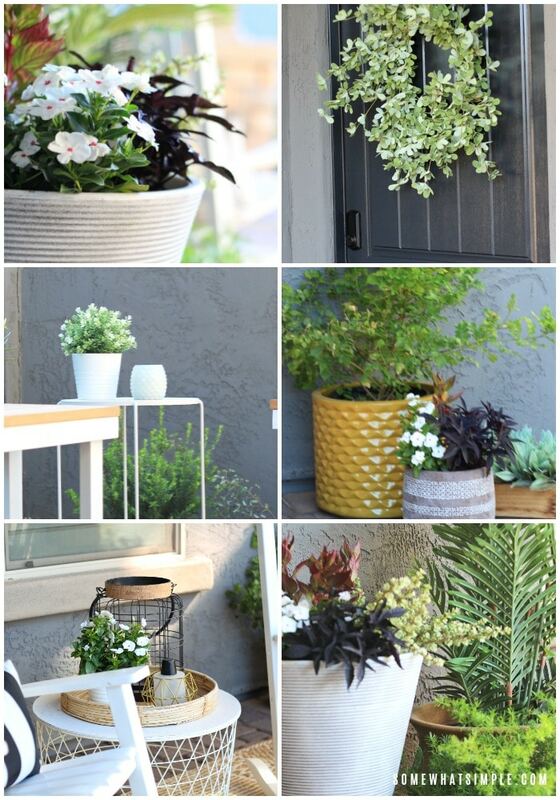 Accessories: Use potted plants, a new welcome mat, candles and metal lanterns to bring in texture and color. We stopped by Lowes to do some shopping! The staff was suuuuuper friendly, the prices were totally affordable, and the product selection was AMAZING! I honestly could not be happier with how this courtyard turned out! FIRST, LET’S TALK ABOUT THE DOOR! 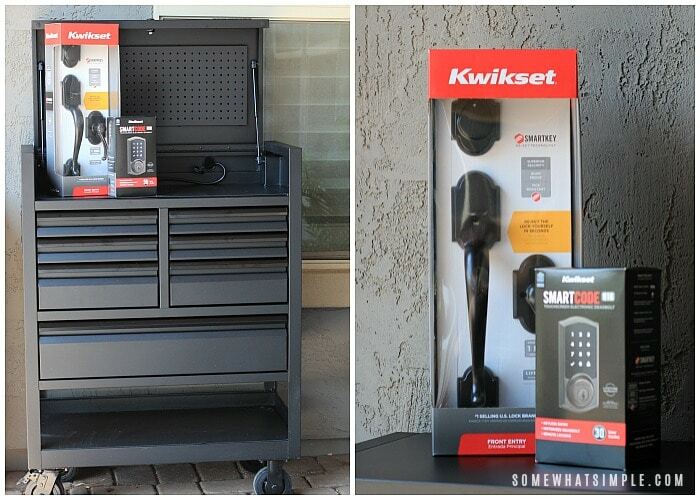 Earlier this summer, our friends at Kwikset sent us a black Kobalt Tool Cabinet and a Kwikset SmartCode touchscreen smart lock. 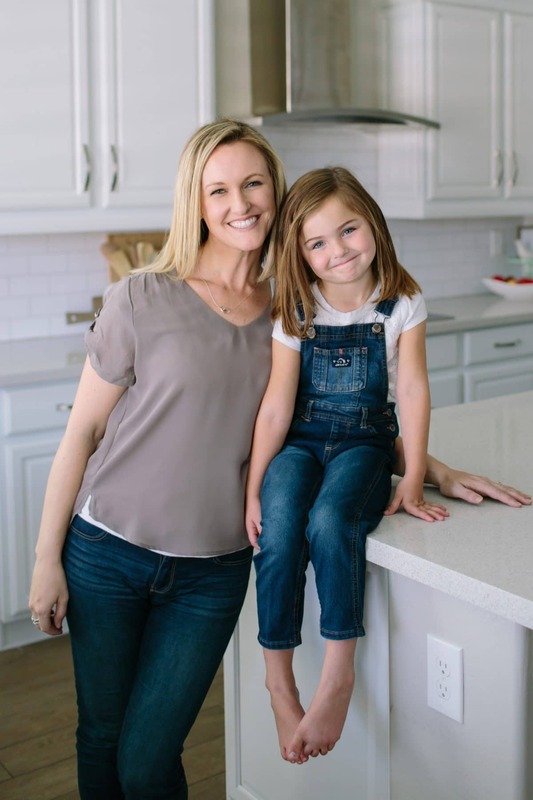 As my kids get older and our schedules get busier, it isn’t uncommon for us to be coming and going at different times during the day. 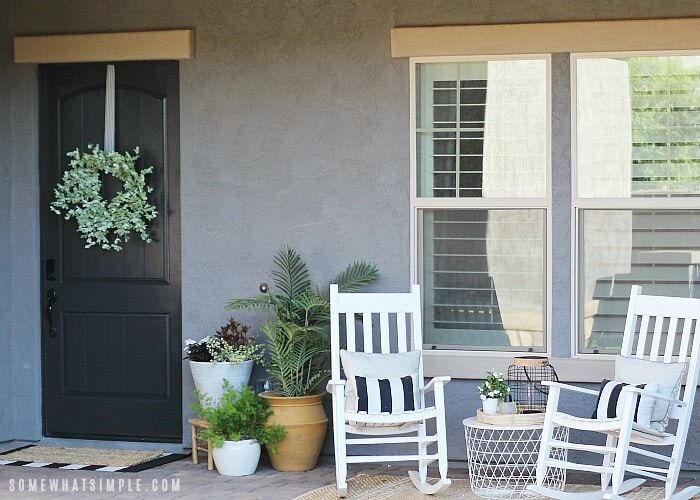 A keyless entry on our front door helps make getting in the house easier on our kids if they ever come home when no one is here to let them in. You guys. Can we talk for a minute about how easy it was to install this Kwikset SmartCode lock? I should mention I have NEVER changed a door knob or deadbolt before – ever. I watched the 5-minute online installation video a couple of times, and then got to work! Within 10 minutes, I had everything installed and working perfectly! Not only that, but I also had my new deadbolt rekeyed to fit my current keys, so I don’t have to make any new or additional copies of my house keys! I was literally SHOCKED (and so excited) at how easy it was to do. Ten minutes you guys. TEN MINUTES!!! If your keys are lost or stollen, you can rekey the lock within seconds without removing or replacing the door hardware with Kwikset’s SmartKey Security. 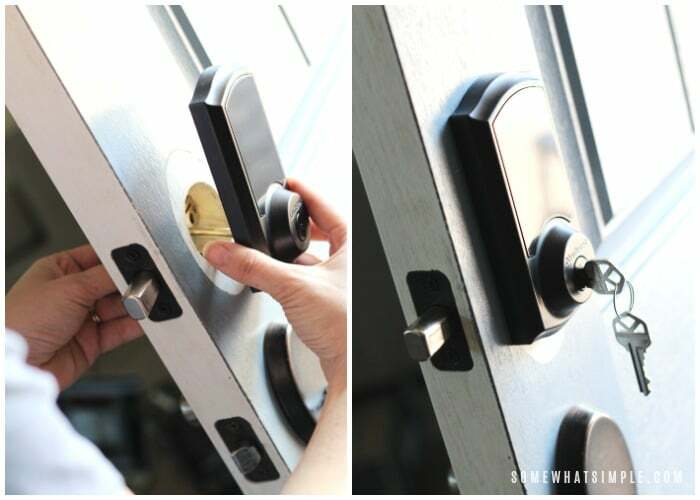 One-key convenience allows you to secure every lock in your home with the same key! Your garage, shop, tool box etc. can all be accessed by the key that opens your front door! 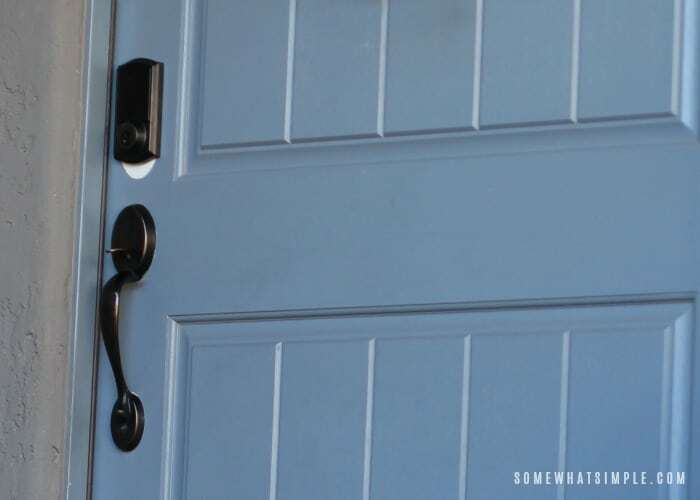 Kwikset products with SmartKey Security are available in a variety of styles and finishes, and they are products you can trust to keep your family safe! And that new Kobalt Tool Cabinet pretty much made my husband’s garage dreams come true! This thing is sleek and durable! It moves around so easily and holds all of our tools without a problem! Once we installed the new hardware, there was a little bit of unpainted area on the door that needed to be touched up. (You might have seen the details on my IG Stories.) 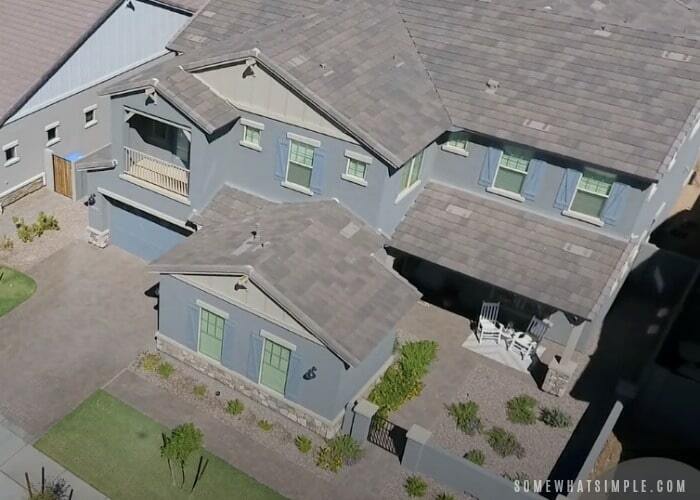 As much as I loved the color blue, it didn’t really fit with my gray stucco. And rather than try to paint-match the blue, I decided to go a bit more BOLD. And so, I painted it a pretty charcoal-y black that looks super sharp and pretty! Don’t you agree? 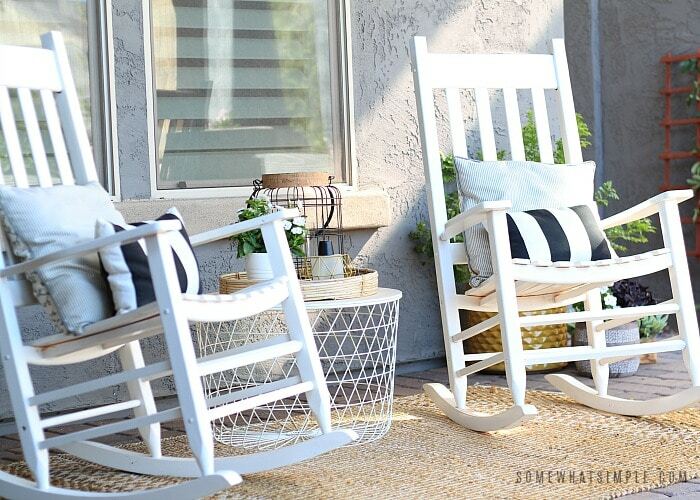 I knew I wanted 2 porch rocking chairs, and these Rocking Chairs from Lowes are absolutely perfect! 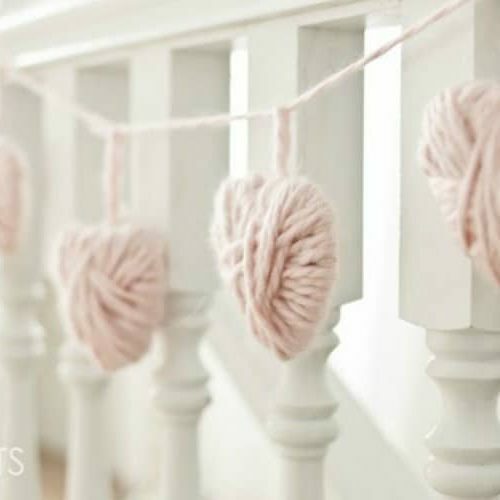 They are sturdy and comfortable and easy to clean. I added a few pillows and a small side table, then set it all on top of a fun jute rug that helps hide the dirt and dust. The biggest part of this courtyard makeover was the excavation of the granite ground covering (aka “rocks”) and the laying of the pavers. Though the original paved walkway was sun-faded, we chose to keep it and order the same brand and style for the rest of the courtyard. (Brand – Belgrade || Style – Cambridge || Color – Sierra.) We filled in the majority of the courtyard with pavers, and left just a small border around the perimeter of the walls for some plants. I seriously LOVE this update so SO much! With the pavers looking all pretty, it was time to fill the space with something that said, “Come on over! Let’s hang out!” I was intending on purchasing a fire pit with a patio set, but I worried that any big furniture would over crowd this space and block the view from the porch. My sister in-law suggested a couple long benches, and I was SOLD! These look perfect, don’t they??? And the fire pit is going to be so great once it isn’t a million degrees outside! I like to change my welcome mat with the seasons, but I am going to have a hard time replacing this one! 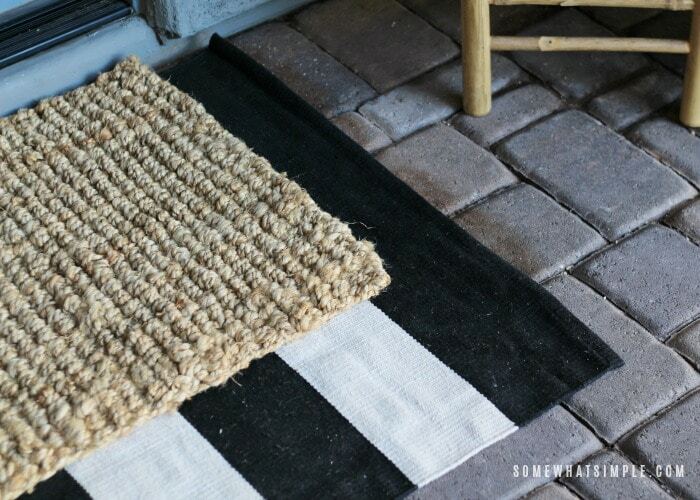 I love the layered look of the black and white stripes under the jute rug! The jute hides so much of the dirt, but the black and white rug adds a fun pattern that also matches the throw pillows on my rocking chairs. It is perfect! One trip to the Lowe’s Lawn and Garden Center made all the greenery in this space happen! I picked up some cute pots + low maintenance plants and we’re good to go! I also added a lantern, wreath and some citronella candles for color and texture. I am seriously so happy with how it all came together! What do you think? Do you like our new courtyard? 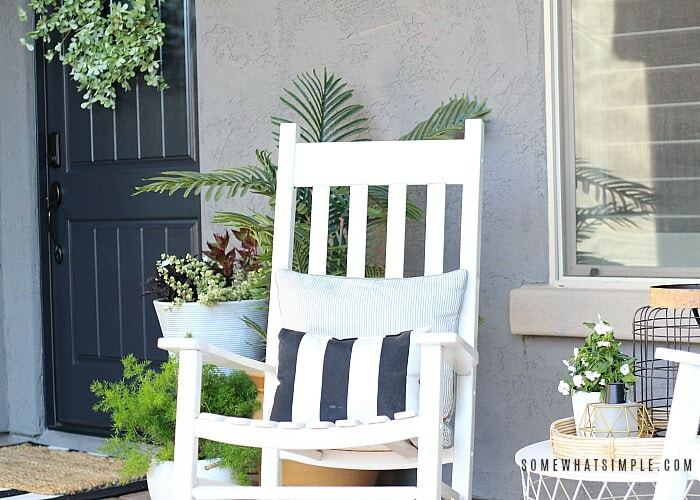 If you’re thinking about updating the exterior of your home with new landscaping, furniture or accessories, I highly recommend that you visit your closest Lowes, or check them out online.